Published models for the Cretaceous seafloor-spreading history of East Gondwana result in unlikely tectonic scenarios for at least one of the plate boundaries involved and/or violate particular constraints from at least one of the associated ocean basins. We link East Gondwana spreading corridors by integrating magnetic and gravity anomaly data from the Enderby Basin off East Antarctica within a regional plate kinematic framework to identify a conjugate series of east-west-trending magnetic anomalies, M4 to M0 (~126.7–120.4 Ma). 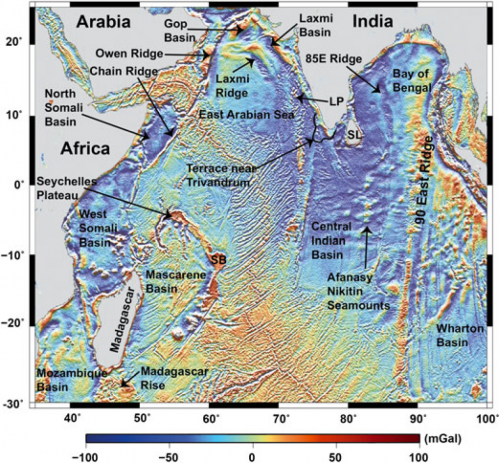 The mid-ocean ridge that separated Greater India from Australia-Antarctica propagated from north to south, starting at ~136Ma northwest of Australia, and reached the southern tip of India at ~126 Ma. Seafloor spreading in the Enderby Basin was abandoned at ~115 Ma, when a ridge jump transferred the Elan Bank and South Kerguelen Plateau to the Antarctic plate. Our revised plate kinematic model helps resolve the problem of successive two-way strike-slip motion between Madagascar and India seen in many previously published reconstructions and also suggests that seafloor spreading between them progressed from south to north from 94 to 84 Ma. 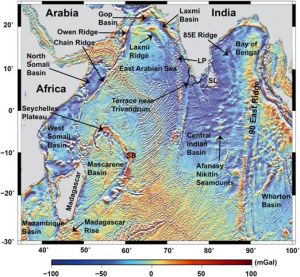 This timing is essential for tectonic flow lines to match the curved fracture zones of the Wharton and Enderby basins, as Greater India gradually began to unzip from Madagascar from ~100 Ma. In our model, the 85-East Ridge and Kerguelen Fracture Zone formed as conjugate flanks of a “leaky” transform fault following the ~100Ma spreading reorganization. Our model also identifies the Afanasy Nikitin Seamounts as products of the Conrad Rise hotspot. Files for download include the magnetic picks, fracture zones, isochrons, continent-ocean boundaries used in the study and the new rotation file that generated.